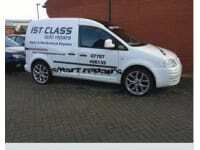 1st CLASS AUTO REPAIRS. A Polite and Friendly Business giving a First Class Service ~ Specialists in Vehicle Paint Work & Mechanical Repairs, we do anything from a little scratch to major Accident Damage aswell as Colour Coding, Custom Paints, SERVICING, Clutches, Brakes, Cambelts, Head Gaskets, MOT'S, etc. 24 hour recovery also available. Call Dan on: 01452 768 684 all with a courtesy car. We won't be beaten on price, FACT!